Merry Christmas Eve to each of you. Hope you all got your shopping done this year. 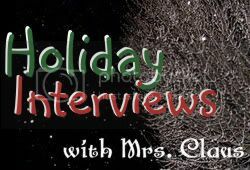 Since we have had such wonderful guest bloggers I thought some of you might be interested in Mrs. Claus' answers to the Holiday Interview for 2010. First Question . . . the question everyone always asks me . . . Why is your blog called "like Christmas every single day"? Well, I do get asked this question alot. At first I wanted to name my blog "like Christmas every day", but blogger lost my link and it got all messed up and then I couldn't add a blog with that name again. So I switched to like Christmas every single day. 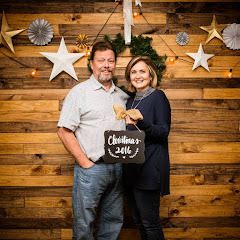 I love Christmas anyway, but since I have surrendered more and more of my life to Jesus Christ, I am just being blessed and every day, something new and wonderful . . . the feeling just like Christmas morning. New presents every single day. If you want to know what a life centered around Jesus Christ is like you can email me, I would LOVE to tell you. So the remaining questions in this interview are about Christmas! YAY!! The food is always amazing during the holidays. We start the food on Thanksgiving and it seems to keep going until January. There are pot luck dinners and parties galore. Someone always has something at Santa's workshop to sample. My specialty is cookies. I know right? How weird is that? I have an assembly line kind of cookie train going. This starts the day before we leave for Thanksgiving and then again before Christmas Eve for cookies for Santa. Now that all the helpers are grown, the cookie baking may be throughout the holidays just so Mrs. Claus doesn't wear herself out. What is your absolute favorite Holiday food to eat (even if you can't make it)? Santa makes a coconut cream pie that is absolutely the best I have ever had. It actually makes me weak in the knees and I have to sit down to eat it. He uses whipping cream on the top instead of Cool Whip. It's heavenly. I call it a "sit-down" pie, cause it's that good. My favorite pie is pumpkin and this year, I guess because I have been good, Santa is making a pumpkin pie for me. Awww! I know, isn't he the best? For Christmas dinner do you have ham or turkey, (or something totally different)? We usually have ham for Christmas dinner, but it just depends on if Santa wants to cook or not. He is the main chef in our house. Mrs. Claus is the cleaner, that works best, if he cooks and I clean/assist. When I say ham, I mean covered in whole cloves and pineapple and basted with a root beer, ground cloves, brown sugar glaze. This year I think we are just going to have chicken and dumplins', it's a favorite! The most special thing at Christmas is traditions for me. Christmas decorations, hanging stockings, lighting Christmas candles and playing Christmas music always puts me in the spirit for Christmas. What is your absolute favorite Christmas tradition . . . the one where if you could only have / do this one tradition it would be enough for you to have a wonderful Christmas? I guess if I could only have one tradition for Christmas it would have to be looking at Christmas lights. I usually can talk at least one person (usually Reese's) in riding around town looking at Christmas lights and listening to Christmas carols. This year we went out one night after youth and got hot chocolate and saw the lights at Wentworth Place (a senior independent living care complex in our town). The lights there are AMAZING! They are animated and larger than life . . . and for Magnolia it's kind of a big deal. LOL! Do you send Christmas cards? Why or why not? Okay, I promised to tell you about my Christmas Cards. I do make a Christmas newsletter every year. This was originally so I could share my children's school pictures with everyone without having to buy all those school pictures for FOUR kids. 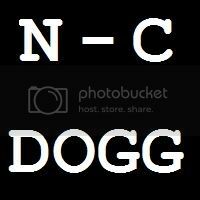 But now with facebook, it seems a little redundant. I know there are some relatives that aren't connected that look forward to the newsletter, so I keep doing it every year. I love sending Christmas cards and getting Christmas cards every year!! Yes, you heard me right, I recycle Christmas cards. No. . . . I don't give them to other people. Well, technically I guess I do. I cut out the pictures from the front of the cards and hole-punch them and use them for gift tags on my Christmas presents. I even recycle other people's cards too. If they are just going to throw them away, I ask if I can recycle them. I have always hated buying tags for Christmas presents and actually before this tradition, I just wrote names in Sharpie right on the wrapping paper, because I just refused to buy those little tags. 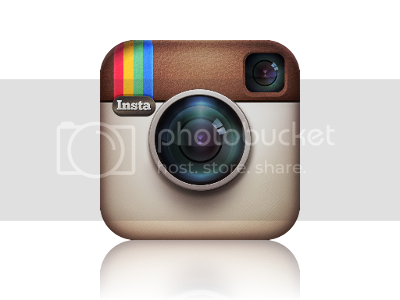 Now my tags are GORGEOUS! And always original. What is the typical holiday routine at your house? You know, Christmas Eve at home, Christmas morning at your mom's or Aunt Betty's . . . what do you guys do? 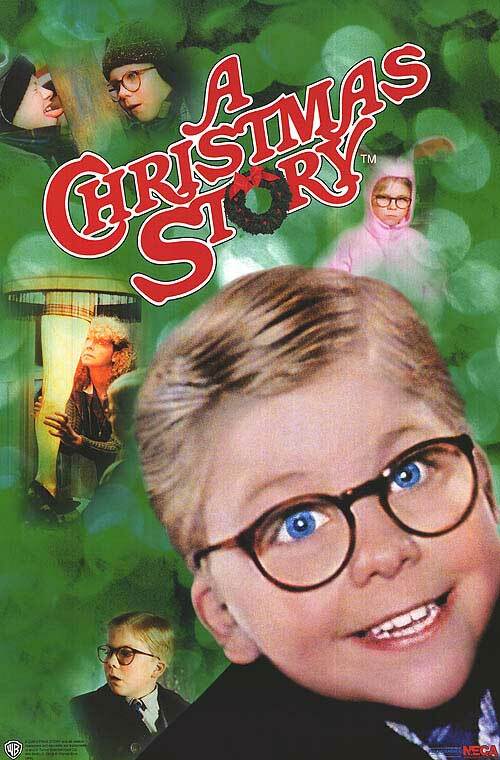 Well, Christmas Eve at our house we watch A Christmas Story and each little helper gets to open one box . . . and it's ALWAYS pajamas. Ever since the kids were little they each got new pajamas on Christmas Eve, so on Christmas morning when the video tape was running, no one had raggedy pj's on. LOL! One year the video taping starts with opening the Christmas pajamas as Santa announces to the whole clan, now go put them on so you can go to bed. They each run past the video camera pajamas in hand . . . .fades to black and then in 1 second everyone comes out wearing them on Christmas morning. . .totally cracks me up every time I watch it. Christmas Day we spend at home with our kids in a mountain of wrapping paper, candy, toys and gadgets that have to be assembled or charged . . . until that evening when we visit our son and his family. After Christmas, sometimes New Year's and sometimes later, Santa's sister and her family come for a weekend to finish Christmas and visit. Sometimes we have gone to Kentucky to visit my family, but it's so far away that it is a rare occassion. What is one Christmas tradition that you used to do (maybe when you were a child) that you don't do now? Visiting my grandparents was a wonderful tradition for me. At my Grandma Ball's house (my mom's mom) we would all hold hands and pray before each meal and whoever was sitting by my Grandma got a pat on the hand and then she would kiss your hand. I always thought it was soo sweet. I miss those days. At my Grandma Jolly's house (my dad's mom) we would get to sign the Christmas table cloth, and throughout the next year my grandmother (and probably others) would embroidery the signatures in red and green thread and date each one so it was in Christmas colors. It was just a plain white table cloth at first but over the years it got filled up. Even little kids scribble on it and she would embroidery the scribble lines. I loved looking back at all those different signatures with the dates to see everyone who was at the dinners. Our children only have one grandparent left and since my Mom lives so far away, it isn't part of their Christmas tradition. That's the sad part. What are you doing this year that you haven't done for past Christmases (if there is something new or different)? This year I asked some of our friends and most of our relatives if we could NOT exchange gifts. I asked if we could have dinner together or spend time together instead of buying gifts, and all of them that I asked agreed. Money is so tight for everyone, we just thought we would buy for the special little children on our list and the grown ups who we love we would tell them we love them, but without the gift. Spending time together is really what we want to do at Christmas, and not really stress out or bust our credit card limits. Right? I do think gifts are great, and giving gifts is always been a big part of Christmas for me. The BEST, absolute best gift I ever got Santa was a 9mm pistol. He thought it was something romantic like a replacement wedding ring because his was lost in the ocean. So when he opened this 9mm gun, he was absolutely thrilled! I don't know if you call that sentimental, but it is to me because it was the only time I ever got him a gift he really liked! What was the biggest dud gift you have ever given someone? You know that one gift that just didn't go over like you thought it would. The WORST, absolute worst gift I ever got Santa was a 4-wheeler. I got a shotgun box, and put a brick in it and a note that said you have a Polaris 4-wheeler ready to be picked up at a local sporting goods store. Santa immediately said he didn't want it. It wasn't a good brand of 4-wheeler and he didn't want it. I was crushed. I cried and cried. Since the pistol I have not been able to buy him a good present for Christmas. That is really sad. What is the best toy or gift you received as a child (that you remember most fondly)? I remember seeing the Barbie Townhouse beside the tree on Christmas morning. But I also remember this one baby doll called "Baby Go Bye Bye". And I actually found a picture of it. She was the absolute cutest doll I had ever seen. 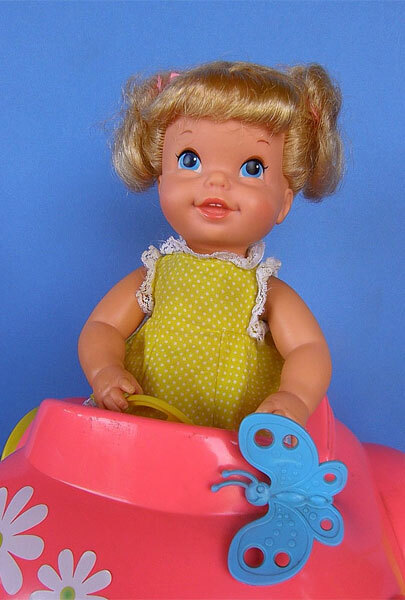 She had a little car that ran on batteries, but even after the car stopped working, I still kept the baby doll. I just love surprises, don't you? Mrs. Claus is one nosy lady, so if you surprise me, you have really accomplished something in my book! This is why Santa's job is sooo hard. What is the best surprise you EVER received on Christmas? Well, the biggest surprise I ever received on Christmas was when Santa got me a cedar chest. I had no idea, absolutely no idea I was getting it. He woke up after I went to sleep and sneaked it into the house so when I got up Christmas morning Santa had come to visit me too. That WAS really special. Would you rather be the surprisER or the surprisEE on Chrismas morning and why? Well, I want to be the surprisEE, but I am really nosy and I usually know what I am getting. I try not to be, but it just happens. So I have given up on surprising people or being surprised. So if you are out there and you want to get me something. . . . don't let on and then I'll be surprised. LOL! Fall is MY absolute favorite season, I love Christmas, but here in beautiful Magnolia, AR it's usually fall weather at Christmas. Do you want snow at Christmas? Why or why not? Well, I always want snow on Christmas. . . but it ain't gonna happen. I'll take snow any time during the winter. It's so rare here that the whole town practically shuts down over just an inch or so. It's kind of funny, but snow is always fun to me. Okay, at the North Pole (actually Magnolia, AR) we are coming to the end of the Santa tradition, because Santa's little helpers are all grown up, but when they were smaller Santa and I had a lot of fun playing Santa . . . . wow this is turning into a weird question . . .
Do you play Santa for your children? Why or why not? We did. We had the dectective (Skittles) who wanted to try to find out if Santa was real. He would leave notes for Santa to sign and then compare the signature from the year before to make sure they matched. He was a clever one. Reese's was also on a quest to prove Santa was really the one leaving the gifts. So I suggested leaving the digital camera by the cookies and asking Santa to take a picture of himself. Knowing all along that I had an extra digital card with a picture of Santa ready to do the swap after she went to bed. My friend's husband was dressed up like Santa at his work and agreed to let me take a picture of him. It worked like a charm, and when Reese's looked at the digital picture of on OUR camera, it was priceless. If you do play Santa, what is the closest you ever came to being "found out" by your children? Well, I guess that would be the one Christmas we had Christmas morning at my mom's house in Kentucky. Lollipop was about 7 or 8 and had already been asking a bunch of questions about Santa anyway. Four kids and Christmas out of town was enough to put anybody over the edge. But we went to bed on Christmas Eve and when we woke up Santa had come to MeeMaw's house in Kentucky. We were all opening gifts and seeing what was in our stockings when Lollipop came out of the kitchen . . .AHA! She exclaimed. Santa is NOT real. Everyone FROZE! My mind was REELING, what am I going to do now, I AM BUSTED!! Santa's over! She's only 8, and the other kids . . . well it's just over!! Of course, the other younger kids were all ears. Did she say Santa's not real? I said, "What are you talking about?" She said, "When we went to bed there were a bunch bananas on MeeMaw's counter in the kitchen and this morning they are not there. MeeMaw put those bananas in our stockings. . . NOT Santa." My mom as quick as a whip and without even missing a beat pulled Lollipop over to her and said, "Sweetie, you really shouldn't say things like that about Santa. You know what while you were asleep Santa asked me if he could borrow some of my bananas since there were so many stockings this year. He didn't expect all of you to be here, he thought you would be in Arkansas. So I told him that was fine. See you need to apologize to Santa Claus the next chance you get. Lollipop's eyes were sooo big, and she was just taking it all in. She practically melted in my mom's arms. It was amazing. Amazing! I love to tell this story about my mom, it is one I will remember for a long time. I just love blogging! I don't know if you feel the same way, but it is so good for me. Just a few questions about YOUR blog and then we're finished. How long have you been blogging and why do you do it? I started blogging a long time ago, but recently picked it back up (I think the beginning of this year) because my mom had started a blog and needed some help with it. I forgot all the tricks and had to start posting again so I could show her what to do. It also really helps you form complete sentences and think things through. How many posts do you typically do per week? It depends on how much work I have. Some days are super slow and I have time to post more than one per day, but then other days, I don't even have time to post once. So it just depends. Do you advertise on your blog? Why or why not? I recently started using Amazon Associates, just because I can choose the products I want to advertise so there are no surprises. But I haven't used it much. Do you have anything special you want to share with readers? The only thing really worth sharing in this life is Jesus Christ. If you don't have a relationship with Him, please email me and I will tell you about my wonderful Jesus! The best you could get is the gift Jesus Christ gives each of us who believe in Him. Merry Christmas and Happy New Year. I hope you have enjoyed this year's Holiday Interviews. Maybe we can do it again next year. Awww, Christmas Interviews come to an end, and you saved the best for last! I'm inspired by your boldness in sharing your faith on your blog and aspire to be as bold on my blog. It was great fun to get to "know" fellow bloggers these past few weeks. I'm looking forward to next year's interviews. Merry Christmas! Great answers!! Love all your traditions! Love the idea of reusing cards for gift tags! Awesome idea! :D Too funny that Skittles was so smart to compare signatures. Hope you and your family have a Merry Christmas!